At Why, we all like to ride a lot of different two wheeled vehicles. Our founders ride everything from ultra aero triathlon bikes to downhill bikes to dirt bikes, and really just about everything in between. 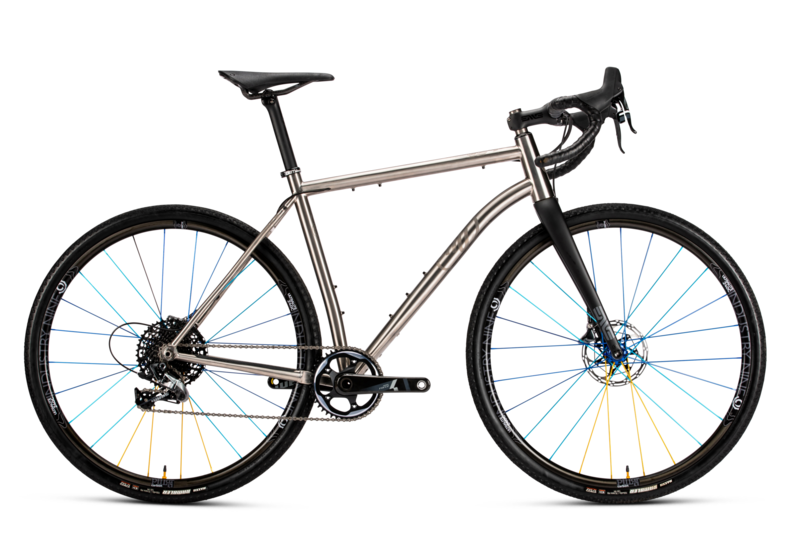 There is something incredibly special about each different type of bicycle, and each one provides a new perspective on why bikes are so incredibly fulfilling. (Ok, maybe we can leave the tri bike out of that statement…) So we decided that we wanted to ride a dirt jumper that was incredibly modern, that was designed to fly over jump lines with ease and comfort and stability and, most importantly, with fly looks to make everyone else jealous. Enter the Why T.F., the Take Flight. 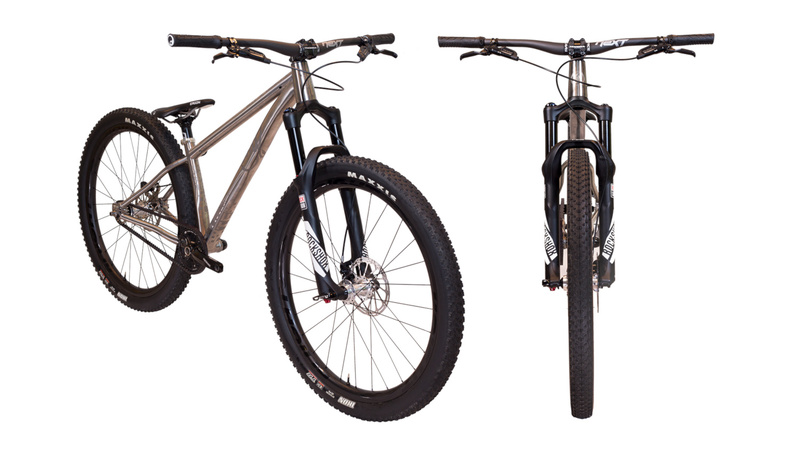 The WTF, for short, is simply the best dirt jump bike we have ever ridden. Run the bike belt driven, single speed, or geared, and we dare you to not hop on this bike and get a giant, cheesy grin on your face. The real kicker about the WTF? 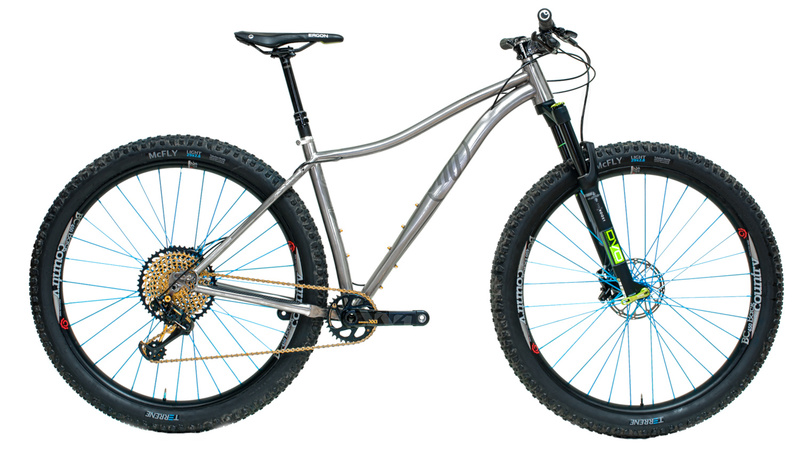 27.5” wheels. Yes yes, dirt jump bikes are traditionally designed around 26” wheels, but we wanted to try this out. 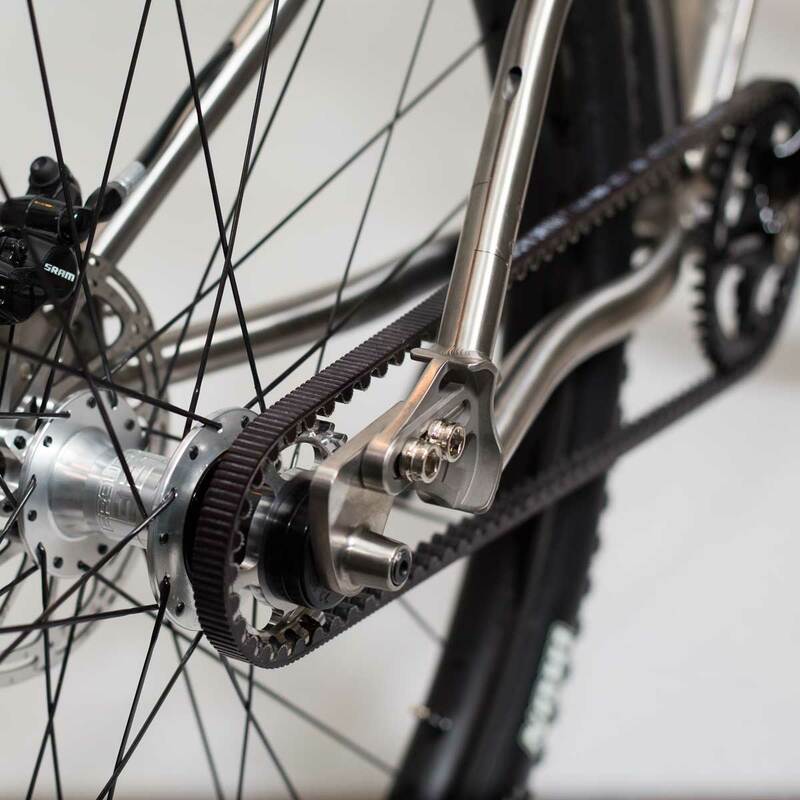 The biggest benefit to the larger wheels is the ability to run a larger bottom bracket drop and keep the pedals at the same height off the ground. The end result is fantastically improved handling and cornering ability, and it is immediately noticeable. 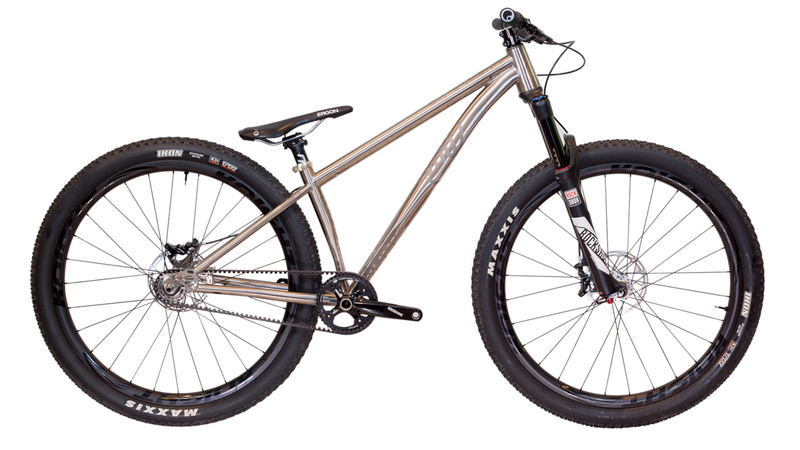 This titanium dirt jumper is one of the most durable, fun bikes to jump in, off, and around anything you might see in your path, and we know you’ll love it just as much as we will. Would you like to see some custom built T.F.’s? Click Here. Shifters – NA-Call if you want gears! Rear Derailleur – NA-Call if you want gears! The Why T.F. 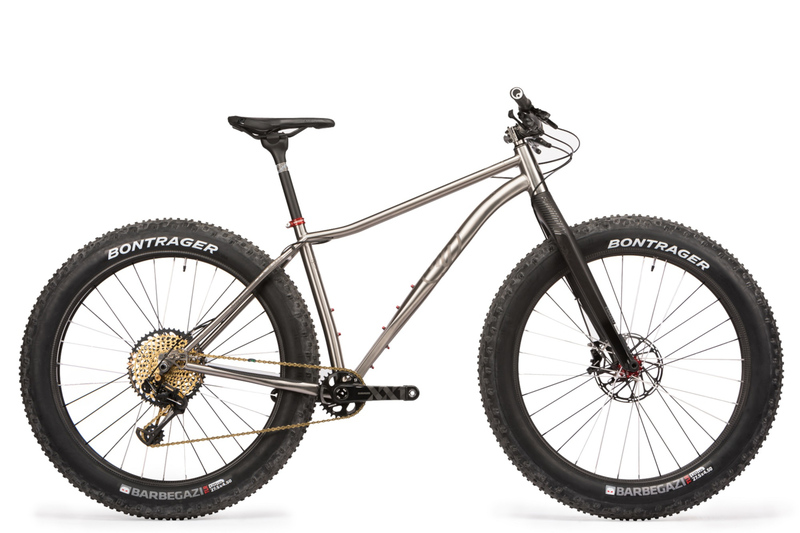 is one of very few 27.5 dirt jumpers available, and therefore has rather radical geometry differences when compared with other DJ bikes on the market. However, when compared with other similar 26” wheeled DJ bikes, the general handing, body positioning, overall feel is very similar. 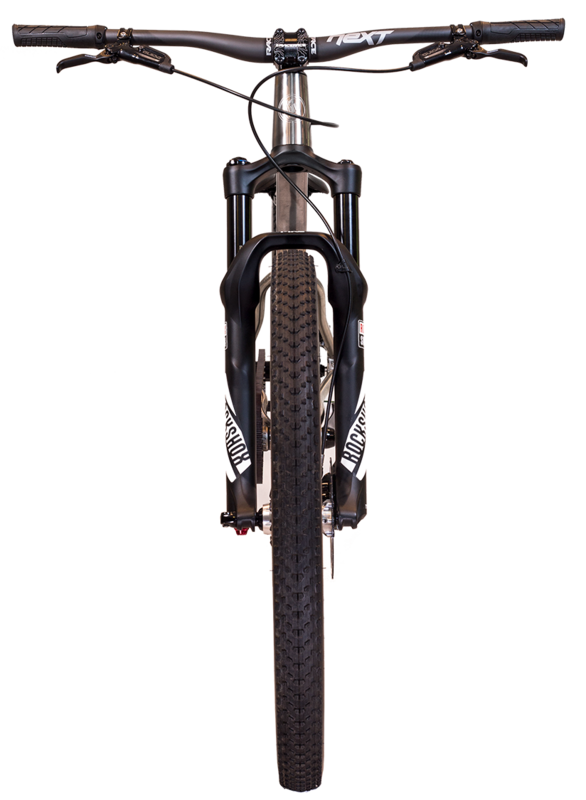 The bike has a much steeper head angle in order to optimize it’s trail number for the quick-handling needs of DJ bikes. 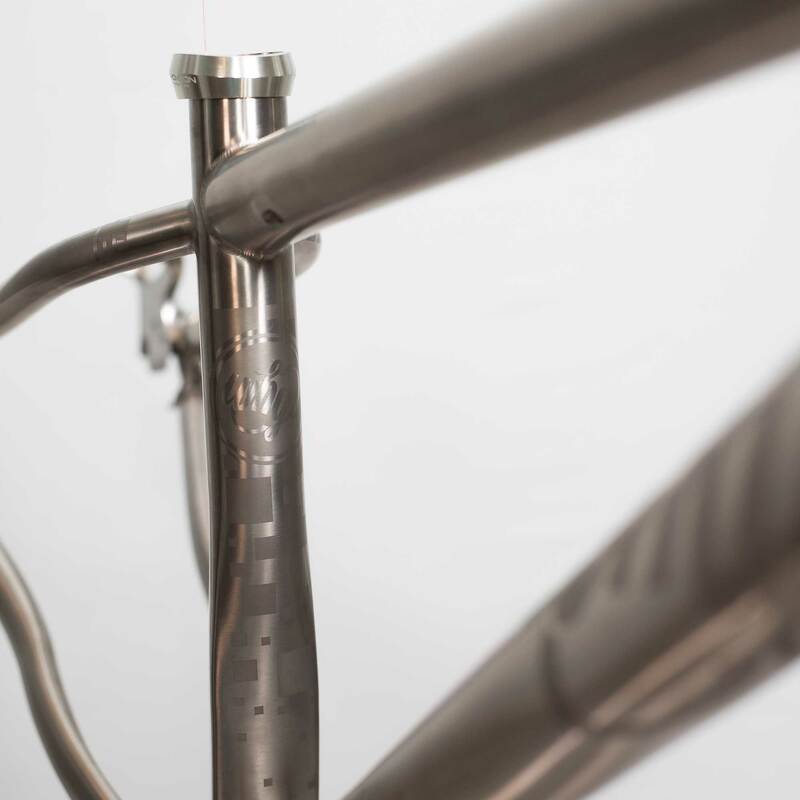 Perhaps the most noticeable difference in geometry comes from the bottom bracket drop of the T.F. 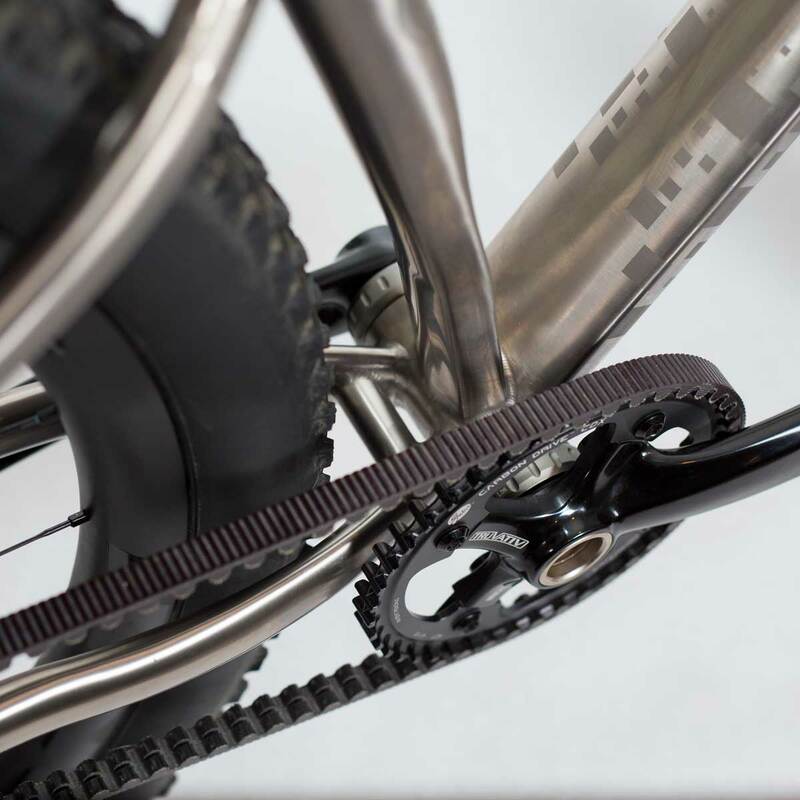 The BB drop affects how a bike corners and, combined with chainstay length, affects it’s stability. With the larger wheels, we were able to achieve a much larger BB drop while maintaining the same crank/pedal clearance from the ground. This makes the T.F. corner and handle significantly more predictably than other DJ bikes on the market. 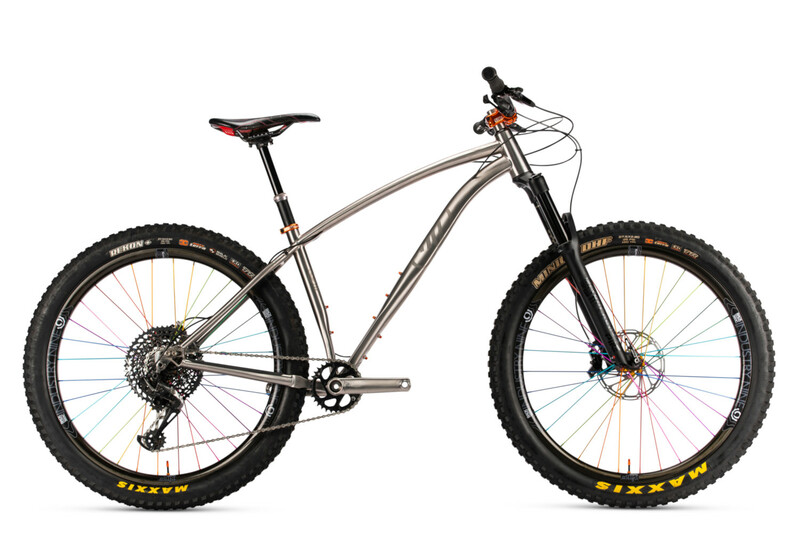 We make our bikes form the best materials possible for the terrain we ride. For now, that means titanium, but we’re not stopping there stay posted. 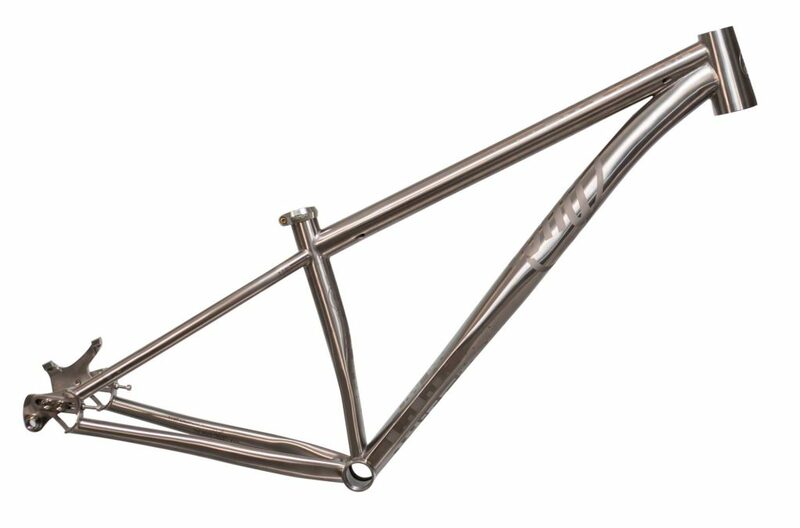 We use the highest quality Grade 9 3/2.5 titanium for our frames’ tubing, and 6/4 titanium for the head tube, bottom bracket shell, and machined bits all over the frame. 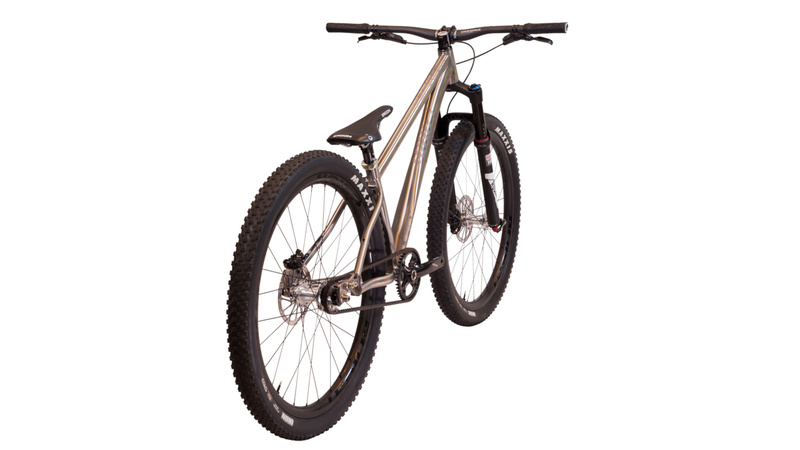 The wonder material has so many excellent ride quality attributes: 43% lighter than steel, higher strength-weight ratio than aluminum, significantly more resistant to crash-damage than carbon, and the best vibration damping properties of all three listed here. 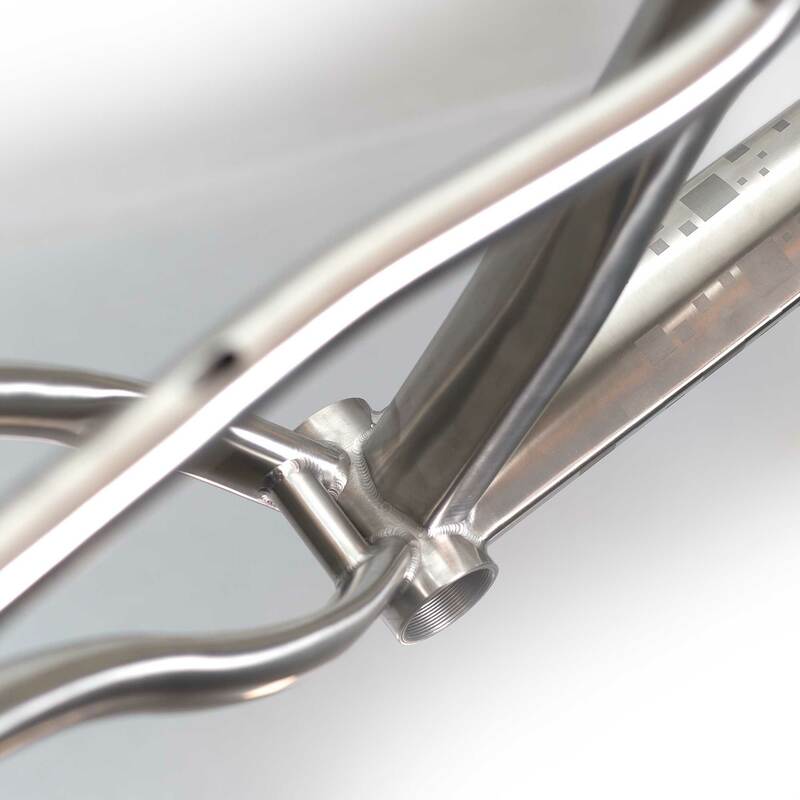 We think you’ll agree that we achieved our goal of creating titanium frames with a modern twist by engineering guided internal cable routing, stealth dropper post routing, integrated headsets, and threaded bottom brackets. 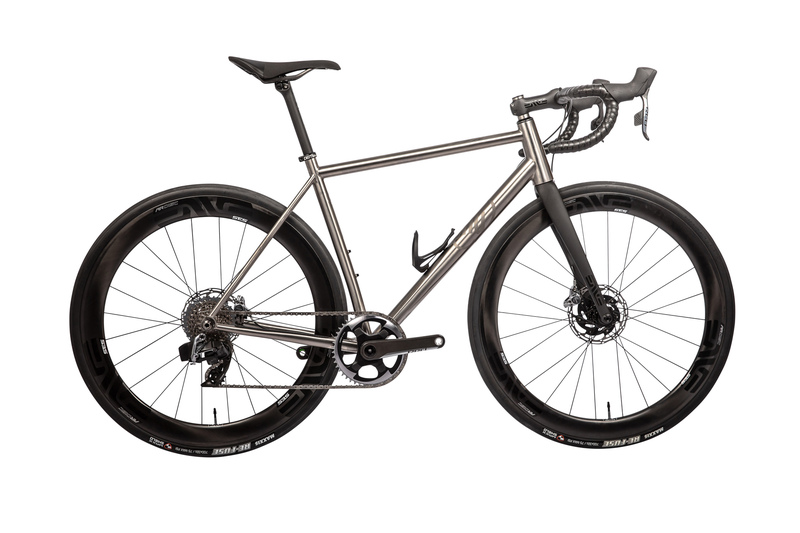 For riders who want a high-end, comfortable, fast bike built to last a lifetime, we believe a properly made titanium frame is the best option. 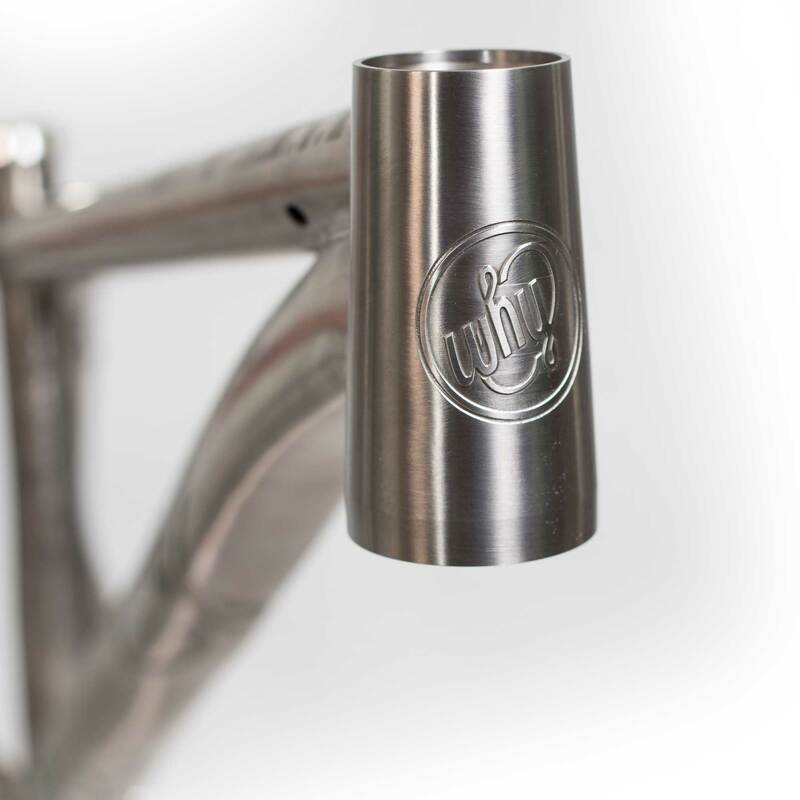 Further, we offer a lifetime warranty to the original buyer on all Why frames. 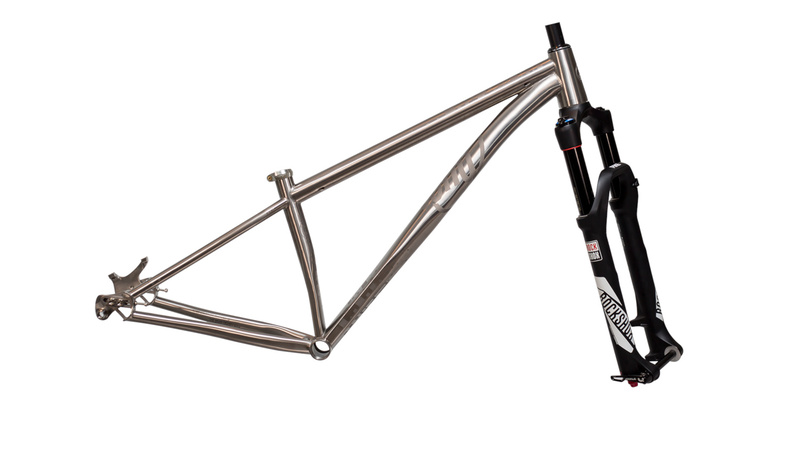 This is a straightforward warranty policy- basically if you use your bike for what it was intended, and the frame ever fails due to a manufacturing defect, we will replace it for you for free. And, to top all of that, we offer a lifetime crash replacement policy. If you crash your bike and damage it, or if you drive into your garage while forgetting there was a fresh new Why on the roof of your car, we will work with you to offer you a replacement frame at a very low cost. There’s nothing better than pedaling up a mountain, cruising along backwoods dirt road, or flying through a flowy dirt jump line. We’re proud of our handmade, uniquely rad bikes that we know you’ll love. We sell bikes directly to you from our website here, promising to offer you the best experience possible when buying, receiving, and, most importantly, riding your new Why. 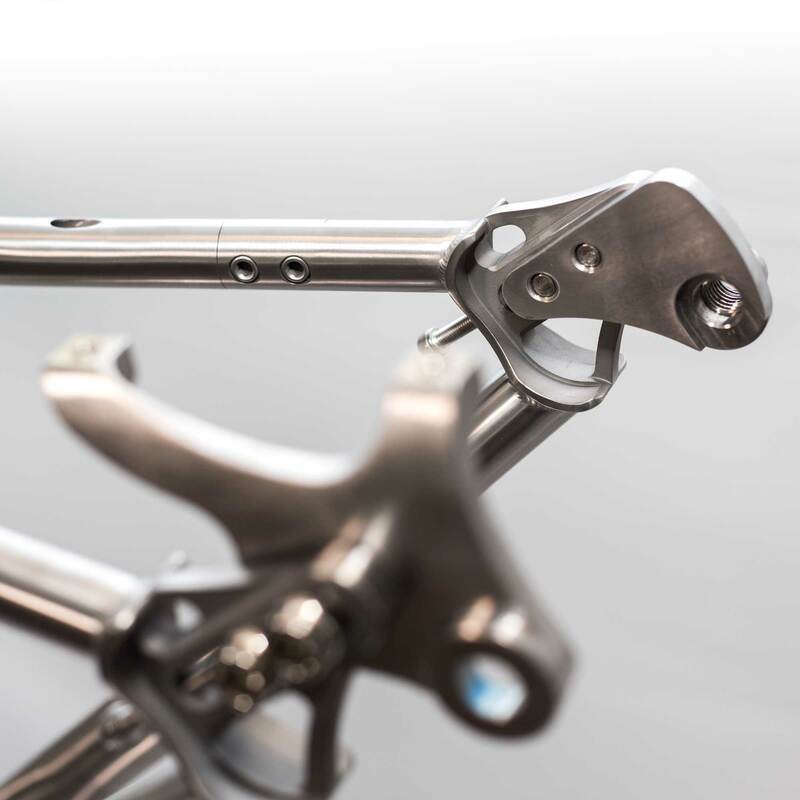 You can rest (and pedal) assured that we designed, tested, manufactured, and built your bike to the highest possible standards throughout the bike industry. 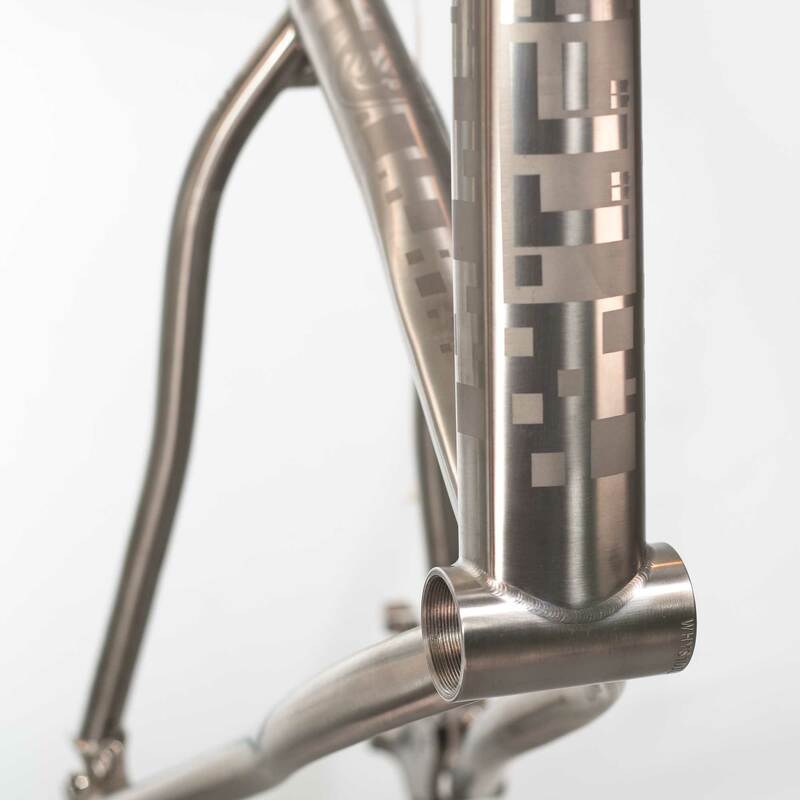 We only create bikes we want to ride, and we stand behind our products with a no-questions-asked return policy and a straightforward, legitimate lifetime warranty and crash replacement policy. Moreover, we ship your bike to you in the best bike travel case on the market: no more wasted cardboard and plastic packaging. It’s our way of going green and giving you the means to bring your Why with you to any adventure in the world. Peruse our site or give us a call – we’re always here to help you find the bike of your dreams and explore the unknowns around the corner.